The mechanical properties of myocardial tissue are primarily determined by the organisation of the collagen network. Quantitative measurements of collagen morphology can help to understand the structure-function relationship in cardiac tissue. In this study, we segmented collagen from high-resolution three-dimensional (3D) images of the left ventricle (LV) mid-wall myocardium obtained using extended-volume confocal microscopy. 3D shape analysis was used to compute the morphological parameters elongation (e), flatness (f), and anisotropy (a). We applied this analysis to both control and hypertensive rat hearts and showed distinct differences between the control and remodelled hearts, particularly in collagen elongation. The predominant form of collagen in the control rat is elongated with a value of e = 0.846 ± 0.041, whereas in the hypertensive rat collagen, is arranged mostly in a sheet-like form with e = 0.301 ± 0.023. 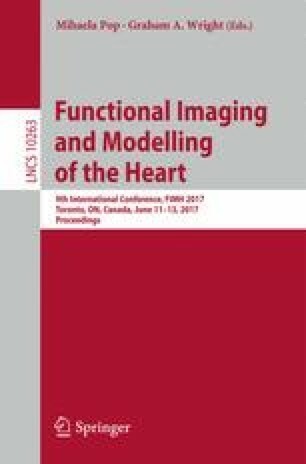 Such quantitative information can be used to develop microstructural models of the myocardium that link the observed changes in cardiac microstructure to changes in mechanical function during the progression of heart diseases, which will help to elucidate the underlying pathological mechanisms.